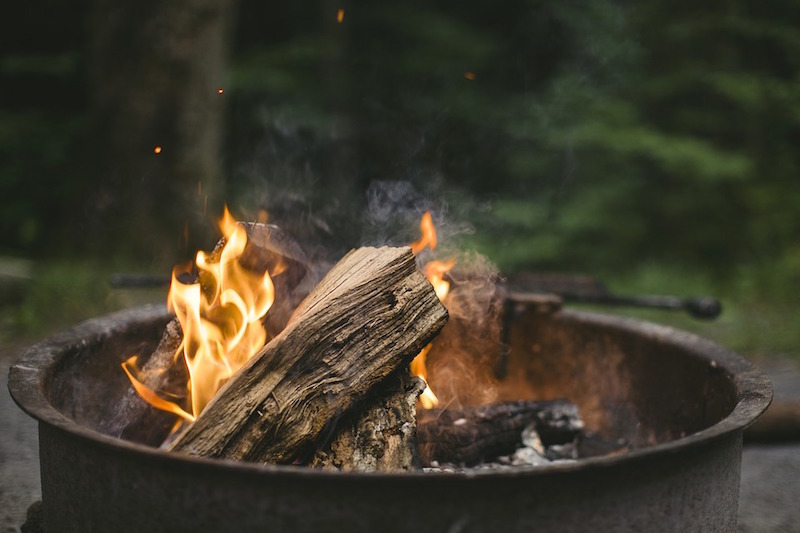 Sitting round a fire with friends is relaxing and warms you up on a chilly night (these winter glamping sites are perfect for chilling round the fire), but in a survival situation a fire could mean staving off hypothermia, signalling for help and an important boost in moral. 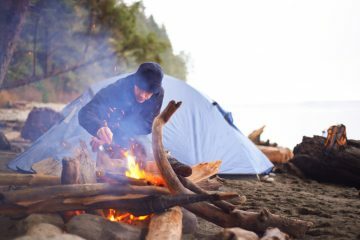 Here, freelance expedition leader and bushcraft instructor Jack Howell explains how to light a fire using a fire steel. As everyone learns in school, fire needs three things. The first is oxygen, which is in the air all around us. The second is fuel, with wood normally being the first choice. The third, heat, is the one that can be tough to generate in an outdoor situation. Everyone is familiar with fire starters such as matches and lighters, but these do have their downfalls. You can only carry a limited supply of matches and they don’t work when wet, while lighters only have a limited fuel supply. 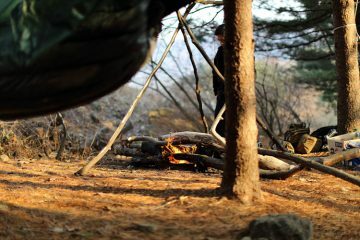 Making and using a bow drill to generate an ember is an extremely impressive skill, but is difficult and takes a lot of time to refine to the point where you can depend on it in a survival situation. Fire steels do not have these issues, they can get wet, allow you to start thousands of fires and are not difficult to use. They are also cheap and lightweight. Striking the fire steel will generate a seriously hot spark, but it won’t start a fire by itself. For that you need some tinder. 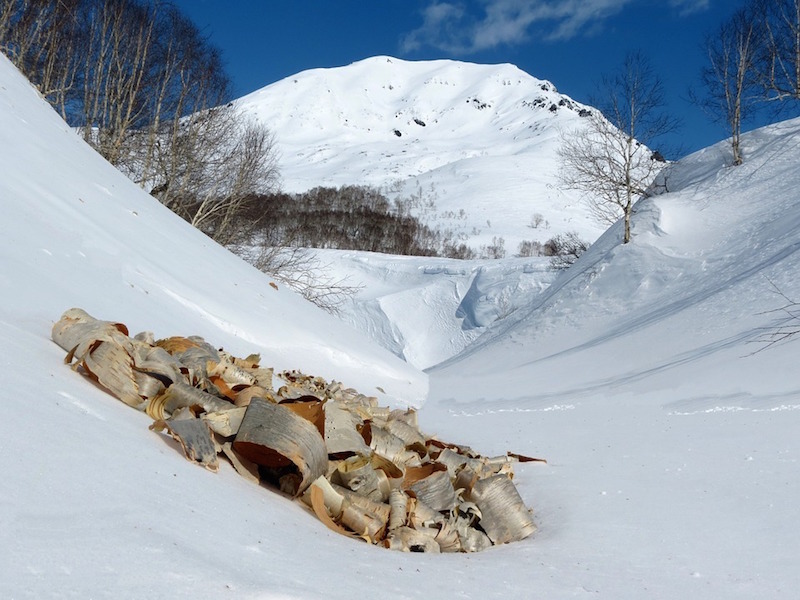 When heading out into the wild you have a number of tinder options, both natural and manmade. The latter includes shop bought tinder sets, scrunched up paper, bandages, or in an extreme case, the insulation from your sleeping bag. Natural tinder options vary depending on where you are, but birch bark peelings, dead pine needles and dead bracken can all be good options, though they need to be dry to be effective. An easy tinder option is cotton wool and Vaseline, which is both lightweight and cheap. This can be carried (pre-coated in Vaseline) in your bag in a small waterproof pot that can be stuffed full. When it comes to lighting the fire, it is worth placing some sticks underneath the cotton wool (or other tinder) to insulate it from the cold ground below, and it also allows oxygen to permeate underneath. The cotton wool should take a spark really well, and once it has you will have the start of a small fire. This then needs to be fed to keep it going. I like to think of a fire as a growing child, so give it small ‘meals’ when small and bigger ‘meals’ as it grows. 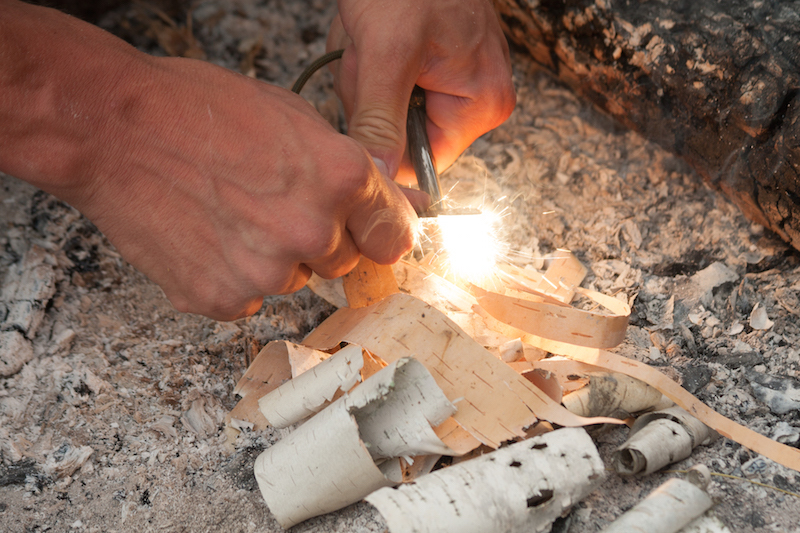 Start with sticks/twigs that are matchstick thick and build up to finger width, then thumb, then wrist thick. If your fire is going to be going for a long time you could even build up to, arm, leg and even torso thick logs. When placing the first ‘matchsticks’ on, hold them above the cotton wool in the flame until they take, this stops them smothering the fire and putting it out. The colder and wetter it is, the tougher it is to get the fire going and to keep it going. In these situations, use more matchstick width sticks to build up the fire and generate enough heat before moving on to the next width up. 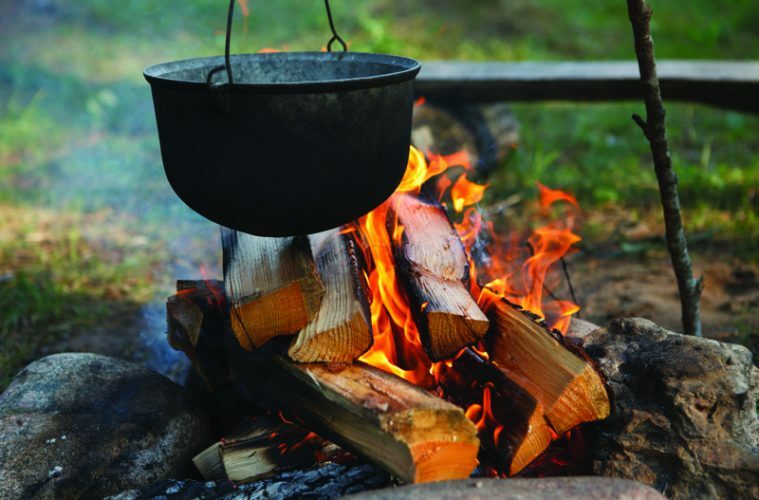 It’s important to collect all the material you’ll need to get the fire to a level where you can leave it to collect more firewood before striking the fire steel the first time. It’s no use starting a fire, leaving to collect more wood and finding it has gone out on your return. Putting the fire out correctly is just as important as starting it in the first place. When leaving a site, there should be no sign that a fire was there. This includes visible signs of charring, burnt remnants of sticks, and also the residual heat that may be left. In certain areas, a fire can smoulder underground and pop up, starting dangerous uncontrolled fires elsewhere. Always make sure there is no heat and the fire is fully out before leaving. 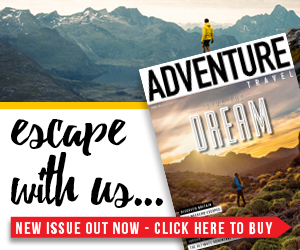 Jack Howell is a freelance expedition leader and bushcraft instructor based in the UK. He spends several months a year in Africa leading groups on volunteering projects. When he is back on home turf he works as a bushcraft instructor for a company providing training camps for children. He has a degree in Applied Ecology and Conservation and has spent three months working on an ecotourism project in Cambodia alongside the indigenous community in the area.